Welcome to our home! I wanted to give you all a quick chance to see some of the neat things we’ve been doing to get ready for the holiday season. Yes, off in the distance that is indeed an overturned cereal bowl. No, it wasn’t empty. And yes! Glad you asked, that is an uncapped Crayola marker in the foreground. We were able to simply throw this together this morning without any advance prep! Come now, don’t feel bad. There is still some December left for you to catch up! Bring on the Christmas Cheers! i see the cap! i see the cap! you are brave to take a picture under a table, btw. I love knowing that other Mama’s houses look like mine in this busy season!! 🙂 Thanks for sharing. Really. It reinforces my sanity. I keep reminding myself, in the midst of cutting and gluing and baking and crafting our advent activities, that the messes are unimportant, but the memories are not. Rachel, you are a peach. That looks like a fun house to be making messes in! This made my heart SO happy. Bless you. I love this. My son’s latest interest is covering himself with crayola art. Thank you thank you thank you! I just told my husband yesterday that I don’t know why I feel like I’m the only mom I know who has a house that looks, well…like I have children in it! Many days I feel as if all I do is clean to no avail. Thank you! This encouraged me this morning! Just found your blog…I think you should do an “I Spy” with this photo…sure made me laugh! Please keep sharing more pictures like this! Love it! My house at any moment between 8a.m. and 9p.m. Why what a charming decorating theme for the holidays! It almost looks like those things just happened to fall there or were misplaced by little hands… but of course we know how hard you worked and to what great expense you went to achieve that haphazard “look.” And to think! You did all that with a houseful of little ones too! 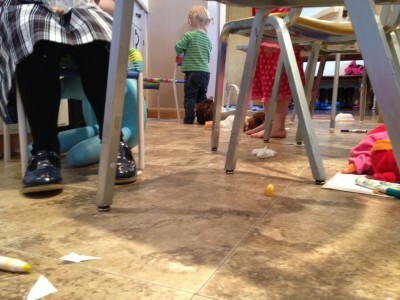 Thanks for the relief that my home is one of many others where holidays (and normal days) are messy! Rachel, I have almost finished your book and it was so encouraging! I loved it. And now, joy abounds: I have discovered your blog! Ah, and I am relieved to merely reiterate what every other mother has commented; your kid-friendly house looks just like mine, in all of its glorious, lived-in, splendor! Rachel is there any chance you want to share your caramel recipe from last year? I think I want to give it a whirl and if they turn out well, I’ll make some for my husbands co-workers! I am always wondering if my house is the only house that can look like a tornado hit before breakfast – it’s amazing how busy those little people can be! Right now there are two big boxes on the floor in my dining room covered with colored paper and glitter (yes, glitter! I am so weak! ) serving as a “gingerbread house – with an addition! !” Messy but oh SO FUN! Thank you for sharing Rachel. I can’t even thank you enough for that picture. I often get so discouraged, and I don’t know what things are supposed to look like, or what it they are “allowed” to look like. It makes me feel better to know that the school/life/home mess that often occurs is alright. I am a little more hopeful about starting my Monday tomorrow. I am so glad that I have found your blog and book! Thank you! I LOVE THIS. Seriously, it is so comforting to see visual proof that I’m not the only one with a floor attractively layered with random objects by artistic small ones!